Adapted from the novel of the same name, Enchanted April (1992) was originally intended to be a television movie for BBC but the powers that be were so pleased with the end result that it was given a theatrical release and it garnered several Golden Globe and Academy Award nominations. 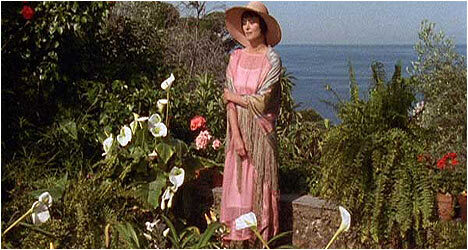 Rose (Richardson) and Lotty (Lawrence) are two prim and proper Englishwomen who decide to rent a quaint castle by the sea in Italy for the month of April. They desperately need to escape their stifling lives. Rose’s husband (Broadbent) writes saucy pulp novels, much to her chagrin. Lotty’s husband (Molina) is an uncouth pig, much to her dismay. To cut down on the cost, Rose and Lotty ask two other women to join them: Mrs. Fisher (Plowright), a pompous widow, and Lady Caroline (Walker), a stylish and bored socialite. They get together every day for meals and initially there is a clash of personalities: the haughty, mother hen-ish behaviour of Mrs. Fisher, the aloof Caroline who just wants to be left alone, the timid Lotty, and the moralistic Rose. Things get a bit more interesting when Rose and Lotty’s husbands show up along with the castle’s owner (Kitchen) altering the group dynamic significantly. However, the place works its magic on everyone as they fall under its romantic spell. Director Mike Newell draws a sharp contrast between England, with its drab earth tones, and Italy, with its lush green trees and vibrant pink flowers. This colourful new environment gives these women a chance to enjoy themselves for the first time in the case of the repressed Rose and the oppressed Lotty. Enchanted April presents the women’s introspective thoughts via voiceover and provides some insight into how this place is affecting them. It goes without saying that the cast is uniformly excellent with veterans like Miranda Richardson and Joan Plowright with the likes of Josie Lawrence and Polly Walker who bring their characters effortlessly to life and are fascinating to watch. The attention to the 1920s period details, especially during the scenes in England, is excellent but also understated. We are never told the year but there is no need to because the production design and costumes tell us everything we need to know. Enchanted April, with its female protagonists escaping their dreary lives for an exotic locale, clearly was an influence on a film like Under the Tuscan Sun (2003), and has the look and feel of a Merchant-Ivory production. This is the first time Enchanted April has been released on Region 1 DVD and the results are mixed. The transfer looks washed out and there are still dirt and marks on the print but hey, it is nice to finally have this film on DVD. The only extra is an audio commentary by director Mike Newell and producer Ann Scott. Newell’s memory of the filming isn’t the greatest but Scott helps jog his memory. She talks about the challenge of getting financing and the pressure to do the novel justice. They shot the film in the Italian equivalent of the French Rivera and had to contend with large, noisy boats during weekends. Newell and Scott share all kinds of anecdotes and complement each other well.